the Bear Blog: Blocks and A Bonus! The City Sampler returns! These are blocks 51-54, and a fine group they are! Several ways to work some triangles into the blocks, shifting colors for different effects. Thanks, Kristina, for your inspiring stitching! 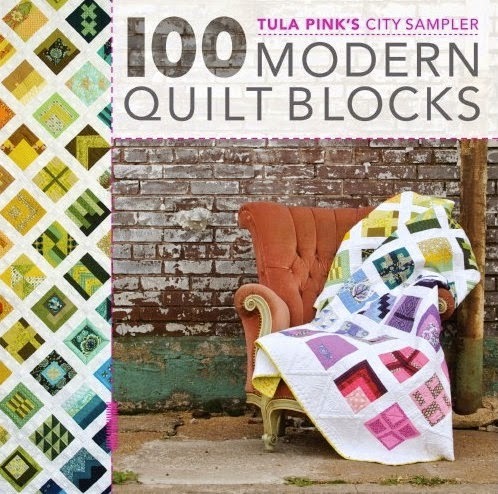 And thanks, Tula Pink, for an inspiring book. Remember to pick up your copy at Bear Patch Quilting Co.! And now for the bonus today! This comes direct from the boss lady, Debbie. She has unleashed her inner crafty self with a bottle of Mod Podge! This is the second time she has made a great floorcloth for Quilt MN. The Itasca mat was made last year with a large printed panel. The patchwork sample below was made this summer with the new (2014) MN fabrics. Same basic technique, just a different look. Here is a brief version of the directions that Debbie compiled. A handout is available at the store. Multi Purpose Cloth is a heavyweight coated fabric for sale by the yard. Supplies: Mod Podge, Multi-purpose cloth (MPC) in the size desired for your mat, fabric for the front and back, foam brush, steel wool or fine grit sandpaper, plastic drop cloth to protect work surface. 1. Cut the Multi Purpose Cloth to the desired finished size. 2. Cut the backing fabric and front fabric 1" larger than the MPC. 3. Apply Mod Podge to one side of the MPC. Immediately lay the backing fabic to the wet surface, smoothing out wrinkle and bubbles. 4. Apply a coat of Mod Podge to the backing fabric. Let dry 1-2 hours. 5. When completely dry, trim the backing fabric even with the MPC. 6. Turn the floor cloth over and apply Mod Podge to the other side of the mat. Center the main fabric, or lay out fabric squares, to cover the entire surface and extend beyond the edges. Smooth out wrinkles and bubbles, let dry. 7. Sand lightly with steel wool or fine grit sandpaper. 8. Repeat to make 4-5 coats of Mod Podge on front and back, sanding between. 9. Finish the edge by wrapping the extra fabric around the edge, then cover the unfinished edge with 1" strips of fabric cut with pinking shears or blade. Adhere the edges with Mod Podge, then apply one more coat over the surface. You can take this method to a whole new level if you wish. Use scraps, triangles, trims, etc., to make it your own. Do you still have a hand out for this floorcloth? If you do could you send one to me? Linda--sorry I didn't find your comment sooner, but we can mail or email that to you if you call the store (651-429-1039) and give us your address. Or email info@bearpatchquilting.com. Thanks!